Earlier this morning, I ran around town knocking out some errands. Nothing out of the usual….stopping by at the dry cleaners, making my bi-daily homage to Target and picking up some groceries. 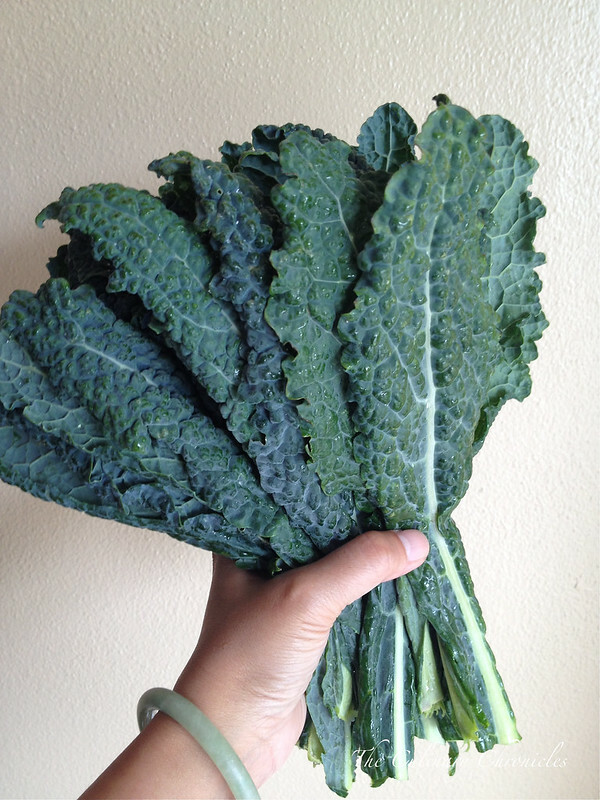 I came a cross a beautiful bunch of organic Lacinato Kale for only a $1! Smoking Deal! This particular variety originates from Italy–Tuscany to be specific. Since I couldn’t pass up the bargain, I grabbed a few bunches for the week. As I was finishing my last errand, I had that moment. That brink when you know things may take a quick turn for the worst. Yeah…I was about to get h’angry. Hide yo’ kids! Hide yo’ wives! It’s not a pretty picture ….and I needing something quick to make to save the world from the Namzilla. As soon as I got into the kitchen, I quickly got a pot of water boiling and threw in some bucatini. 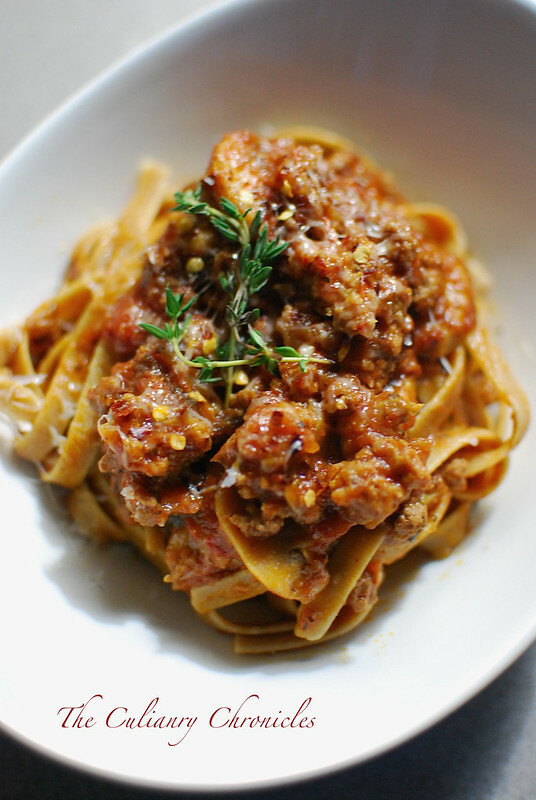 At first glance, bucatini looks like a thick spaghetti noodle. But it actually is hollow inside and has a great texture and “toothiness” because of it. 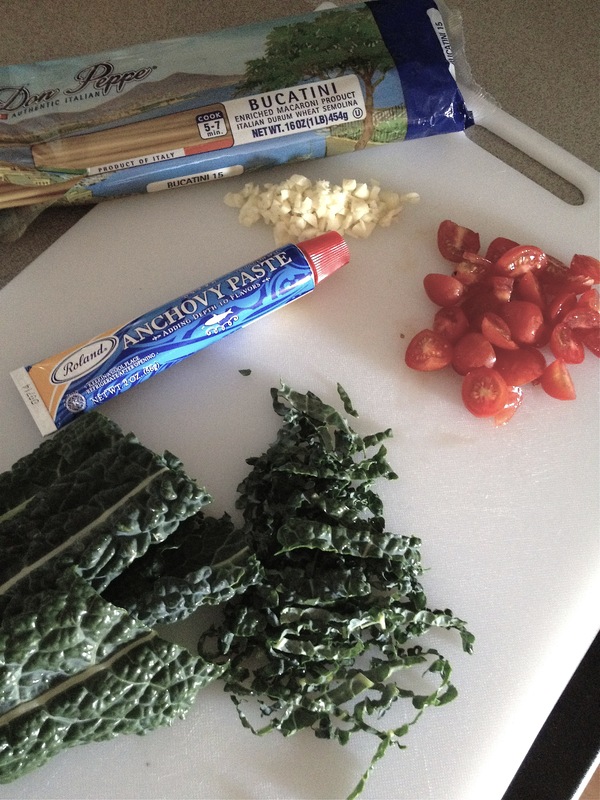 While the noodles boiled, I minced up a pile of garlic and chopped up the kale into thin, long strips–a chiffonade. After quickly sauteing the garlic in olive oil, I added a generous amount of red pepper flakes and a huge dollop of anchovy paste. Don’t freak out. The anchovy paste does not taste “fishy” at all but adds a rich, salty depth of flavor that you just can’t replicate. And if you don’t have anchovy paste, feel free to use 2-3 anchovy fillets. 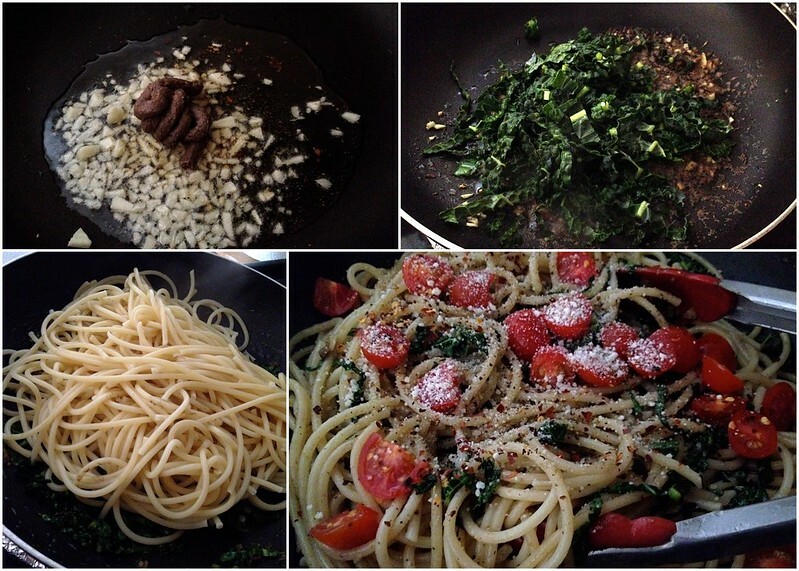 Once the oil is infused with the garlic and anchovies, I added the kale and cooked them until they were tender but still had a bite to them. 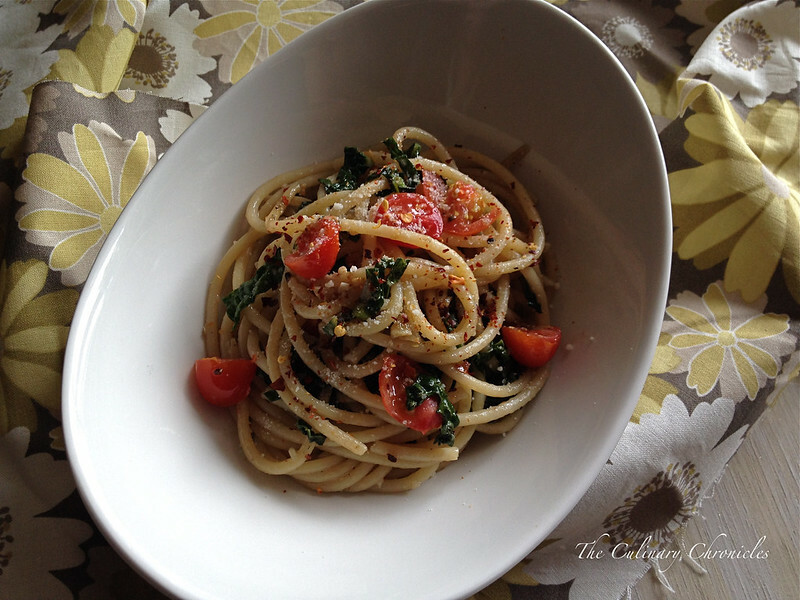 Toss in the cooked bucatini, chopped tomatoes, parmesan–and that’s it!!! Super quick, super savory, and totally satisfying. The whole thing took about 15 minutes to whip up and is perfect for a fast weekday meal. Boil the pasta for approximately 7-8 minutes in heavily salted water until al dente. Drain the pasta and reserve ¼ cup of the starchy water that the pasta was cooked in. While the pasta cooks, heat the olive oil over medium heat in a large skillet. Add the garlic, red pepper flakes and cook for 1-2 minutes to infuse the oil. Add in the anchovies and stir until it melts into the oil. Toss in the kale and cook for 2 minutes until the leaves have wilted. Toss in the cooked bucatini, tomatoes and cheese — coating the pasta well. If you want a looser based “sauce”, add a tablespoon at a time of the starchy pasta water until you reach your desired consistency. Season with additional kosher salt and black pepper as needed. Plate the pasta and cover each dish with additional parmesan and red pepper flakes. It’s something I enjoy ordering when eating out….confit de canard, pan seared duck breast, or even a glistening Chinese style roasted Peking duck. But it’s not something I really make at home. So when we chose it as the main star for our last Sunday Family Dinner, it took me awhile to decide what I wanted my contribution to the meal would be. The teenagers have been exposed to duck for years now but I was wary of serving the younger muchkins something along the lines of a rare pan seared duck breast. Not that they don’t have refined palates (they shovel down high end sashimis and lobsters like no one’s business) but I wanted to make something that I knew would go over easy and while expanding their taste buds. 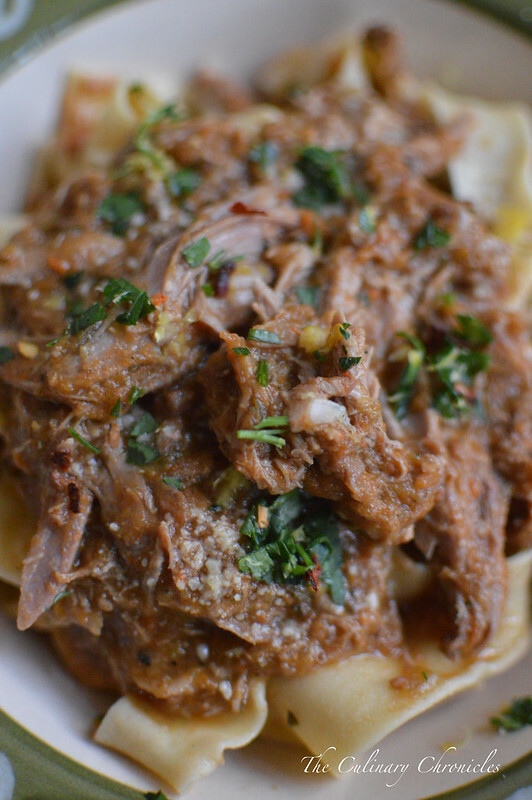 A sugo over fresh pasta seemed like a no brainer. 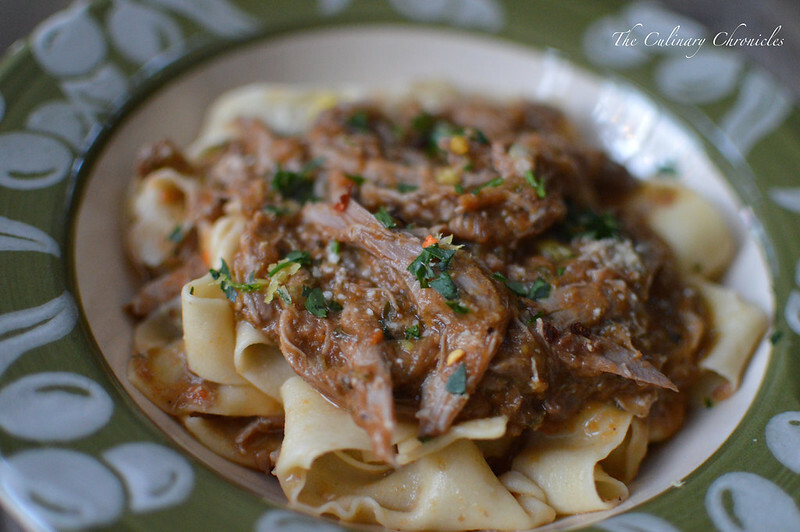 Slow braised and simmered so that everything would be married together in flavor. As I shared in my last post, we picked up whole ducks (heads, beaks, feet and all!) that I warily broke down. And although it did test my psyche as I took a huge cleaver to the little duckies, you do get the best bang for your buck when you go with this route. Plus, I was able to use all the leftover parts to create a rich, deep duck stock that we not only ended up using in the sugo but had quarts leftover for later use. While the stock simmered away, I took on the mise. Yup…that’s right. 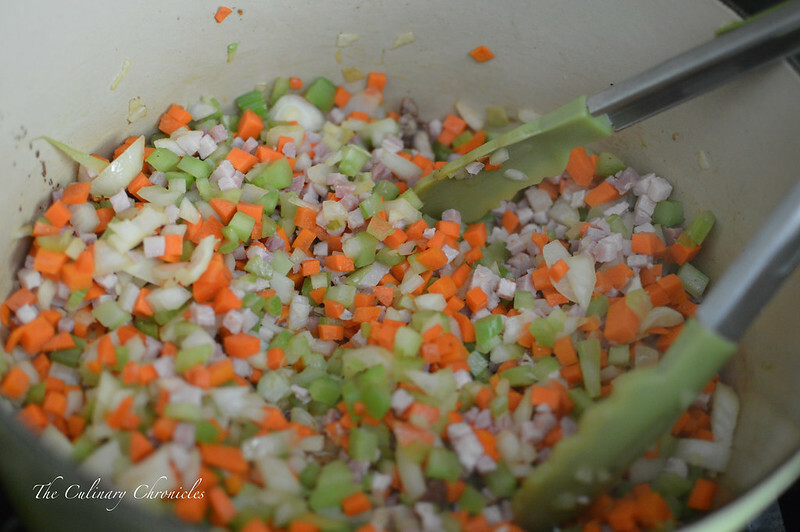 Any slow cooked sauce I make almost always contains a mirepoix. Translation? Lots and lots of diced onions, carrots and celery. And of course there must also be lots of garlic and fresh herbs. To add an extra depth of flavor, I used reconstituted porcini mushrooms. The mushrooms and their liqueur (the liquid that reconstituted the ‘shrooms) were both used in the sugo. And if you haven’t noticed, I’m kinda obsessed with ‘shrooms of all sorts. Once the mise is done, I get to browning the duck. Because I don’t care what anyone says— browned meat before a slow cook always makes things taste nice. After the duck is golden brown, you remove it from the pot to allow it to rest. Using the leftover olive oil and rendered duck fat, start sweating away the mirepoix. At some point, cubed pancetta also gets thrown into the mix. And yes, I realize that this is a duck dish but are you really surprised that I would sneak some pork into the party somehow? Next comes the poricinis, its liqueur, white vino and some more homemade duck stock. By the way, if you’re not as obsessive as yours truly, feel free to substitute with store bought duck or chicken stock. I wouldn’t blame you for it. Once this all done, you throw the browned duck back into the pot, plop a lid on it and slide it into the oven for about 1.5-2 hours so that it can do it’s magic. Where are the pictures of this step? Um…let’s just say that someone was too busy drinking a cocktail and forgot to snap a photo of it. Oh who are we kidding…that someone was me. 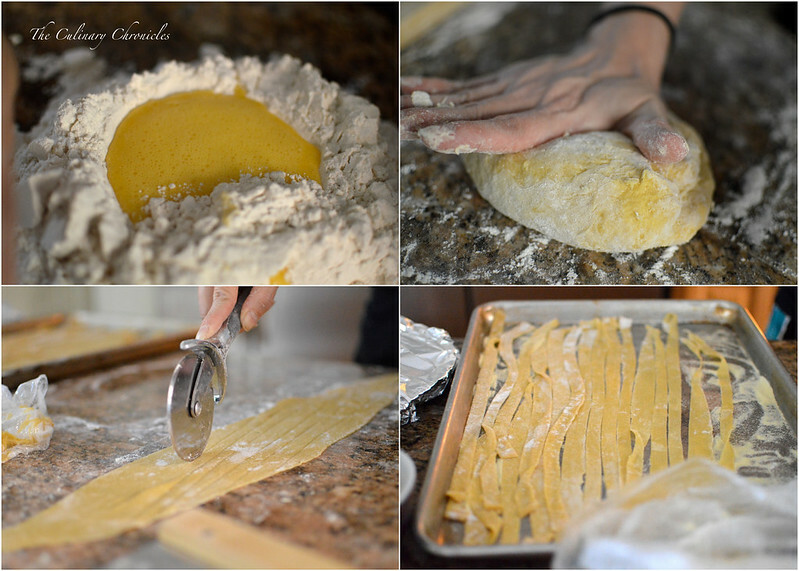 You can also take this opportunity to finagle your big seester into making fresh pappardelle pasta. Sure, you can use store-bought but this is what big seesters are for. For making homemade pasta and to bail you out of jail helping out in tricky situations. Once the duck becomes super tender, you remove it from the veggies and shred it into pieces. 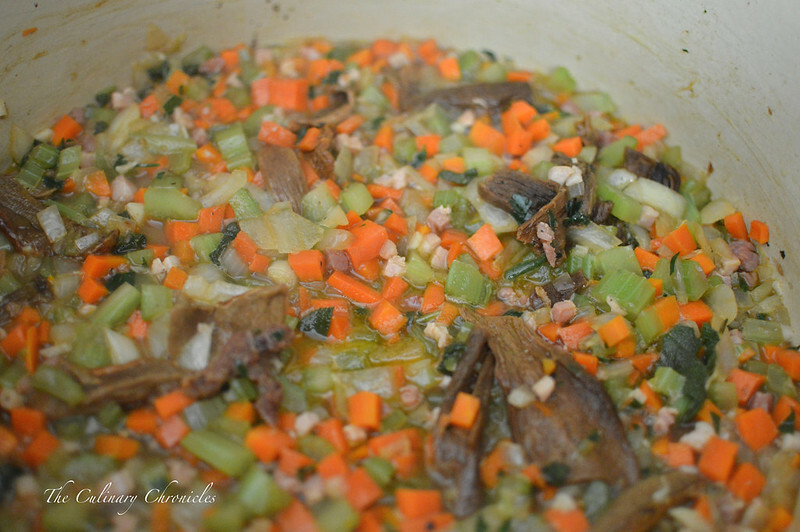 Then, blend up the veggies and add the meat back into the pot for a last simmer. 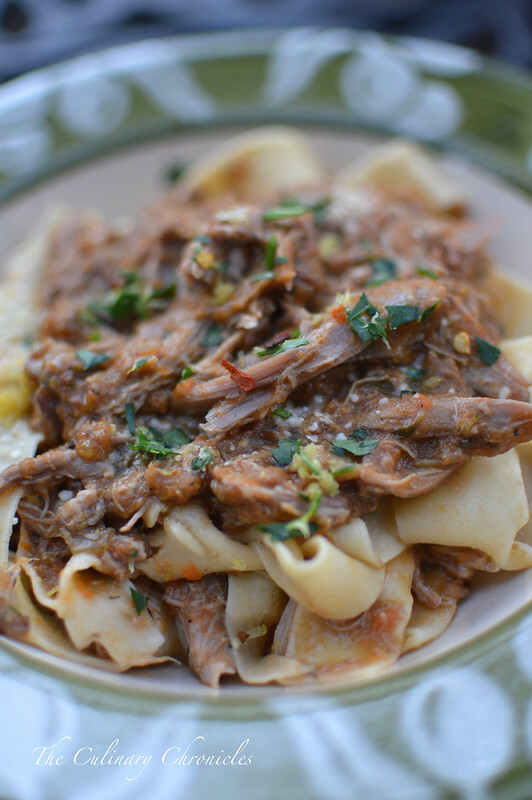 Once it’s all done, toss the sugo with the fresh al dente pappardelle and top with a bright gremolata. Especially when you add the bright notes from the gremolata and earthiness from the parmesan. I’ll be the first to admit that it’s not a quick process. Not even close! But sugos are meant for slow cooking days when you’re hanging out at home with loved ones, sipping on vino (or cocktails — or BOTH!) and when you just want to cook something delicious to share with your loved ones to show—well, how much you love them. Perfect for a Sunday Family Dinner. Heat ½ cup of the duck (chicken) stock and place in a small bowl. Add the dried porcinis, ensuring that all the mushrooms are covered in the liquid. Set aside. Heat the olive oil in a dutch oven or other heavy-bottom pot over medium-high heat. Season the duck with kosher salt and black pepper. 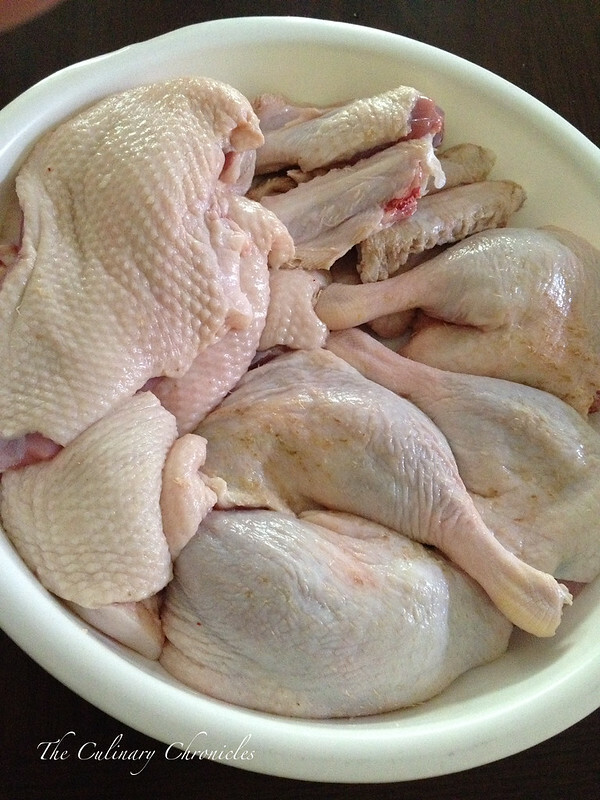 In batches, brown all sides of the duck and remove to a large plate to rest. Lower the heat to medium and add the onions, celery, and carrots. Cook until the vegetables are softened but not browned, about 7-8 minutes. Add the pancetta, garlic, ½ teaspoon red pepper flakes and cook for another 5 minutes. 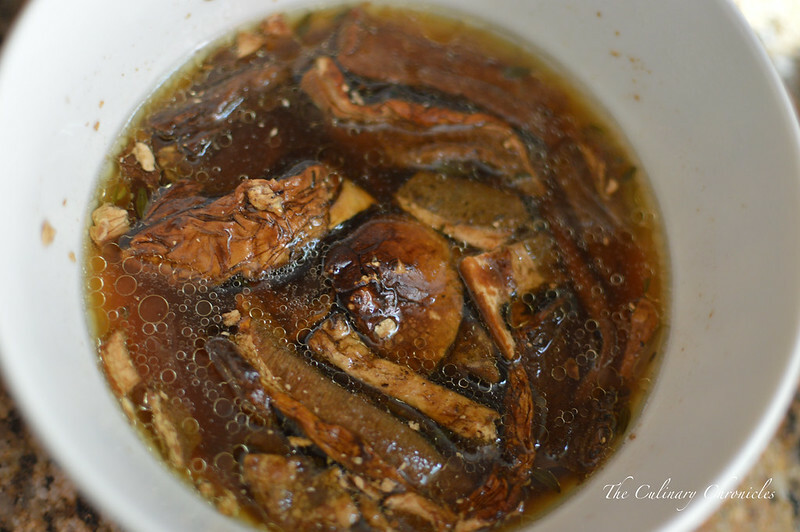 Add the dried porcini mushrooms that were reconstituted in the stock, saving the liquid (its liqueur). Pour in the wine and stir the vegetables around. Cook until the liquids have been reduced by half. Stir in the liquid that the porcinis were reconstituted in–careful not to add in the mushroom grit/sand. Add the remaining duck (chicken) stock and allow the liquids to come to a boil. Nestle the browned duck back into the pot amongst the vegetables along with the thyme, rosemary and sage. Once the liquids come back up to a boil, cover the pot and place into a 300 degree F oven for 1.5 -2 hours, until the meat is very tender and falling off the bone. 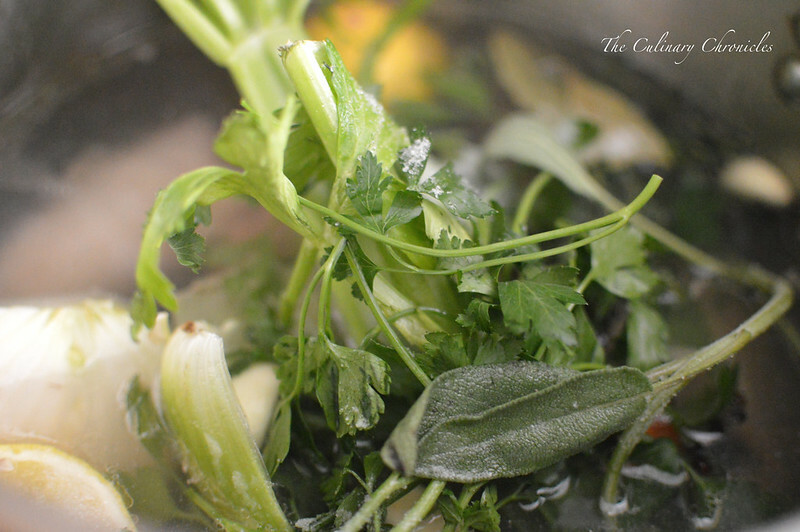 While the duck braises, prepare the gremolata. In a small bowl, add the parsley, lemon zest, remaining red pepper flakes and a few pinches of kosher salt. 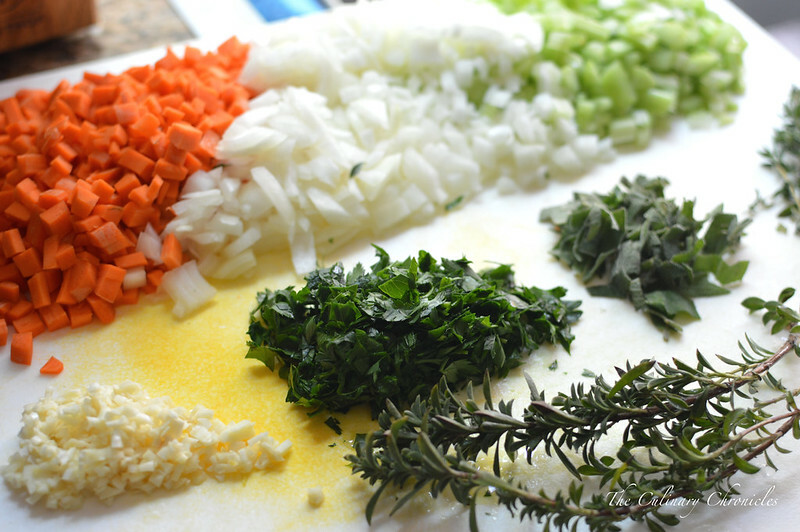 Use a fork and mash the ingredients together allowing the natural oils from the parsley and lemon to be released. Set aside. 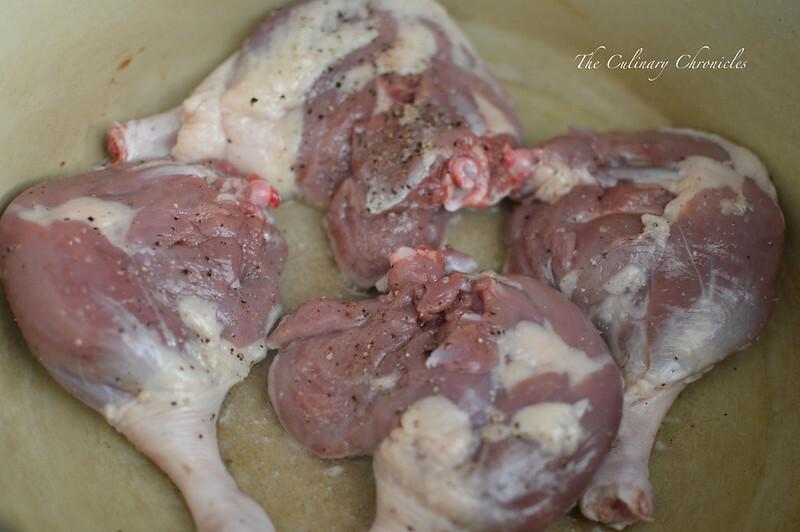 Once the duck has finished cooking and is very tender, carefully remove the pot from the oven. Transfer the duck to a platter and allow to cool slightly. Once the meat is cool enough to handle, remove the meat from the bone and shred it into bite sized pieces. Returning to the pot of vegetables, skim off and discard as much oil/fat from the surface as possible. Using an immersion blender, puree the vegetables until it becomes a fairly smooth sauce. Taste and adjust with additional salt or pepper as needed. If you don’t have an immersion blender, you can use a standard blender or food processor. Add the shredded duck back to the pot and allow the items to simmer and thicken the sauce over low heat for an additional 10-15 minutes. While the sugo simmers, bring a large pot of salted water to a boil. 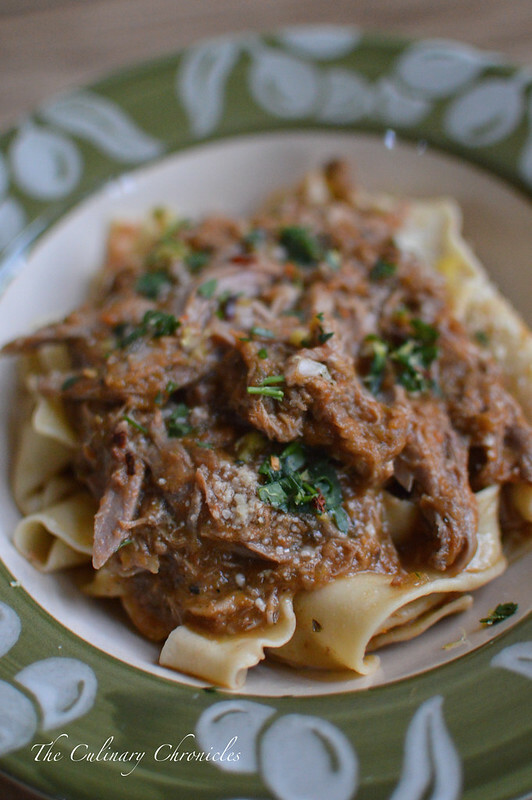 Cook the pappardelle until al dente. Drain the pasta, reserving about ½ cup of the starchy water. Add the cooked pappardelle into the sugo, coating the pasta well. If you want a looser based sauce, add a tablespoon at a time of the starchy pasta water until you reach your desired consistency. Taste and add additional salt and pepper as needed. 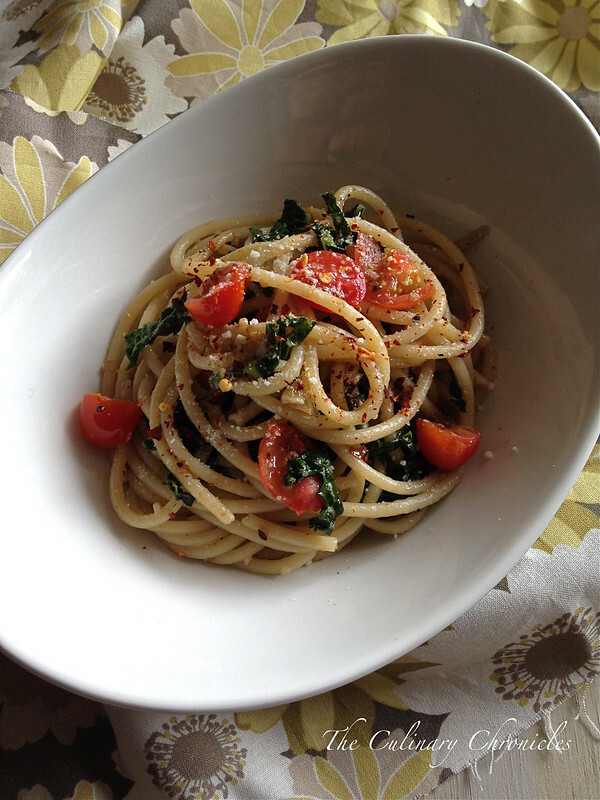 Plate the pasta with the sugo and top each plate with the grated parmesan cheese and gremolata. The one who I probably shouldn’t name. No, not Volde–DOH! Man…that was a close one! Oh to heck with it…… I’m talking about the An family. You know…the gatekeepers of the Thanh Long, Crustacean, ANQI (and more!) Dynasty! Oh how I love their butter dripping, garlic staggering roasted Dungeness crab and noodles. Many places have developed their own riff off of Mama An’s famed crab and noodles (including yours truly) but I’ll always have a soft spot for the old nostalgic and original Thanh Long in the Outer Sunset of SF. It’s where my seester first brought the family over 20+ years ago when the restaurant looked like a small mom and pop joint with mismatched plates and peeled painted walls. Aromatic garlic perfumed the small restaurant with the constant sounds of cracking crab. But a lot has changed since then…..a boom of high-end sister restaurants and the creation of an empire. But one thing remains the same…..those DAMN GARLIC NOODLES!!!!!!!!!! So good that although I’ve posted my knock off recipe nearly 4 years ago, I believe they deserve a re-post. Especially with better pictures! Ugh…I cringe at how bad those earlier photos were. These garlic noodles are so darn easy to make and are the PERFECT accompaniment to seafood—particularly shellfish. 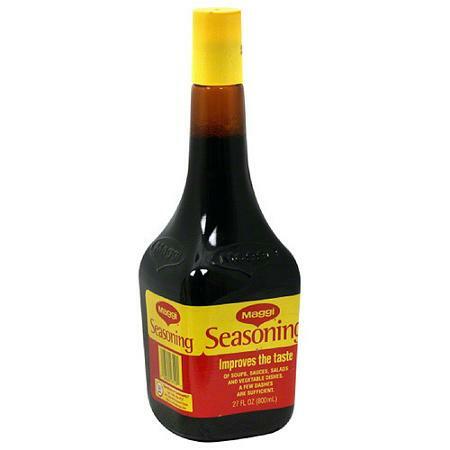 But like I said before, you cannot skip out on the magic ingredient – Maggi Seasoning Sauce. Don’t let anyone else lie to you…there’s really no substitute. It’s a couple of bucks and can be found in any Asian grocery store. It lasts a gazillion years so just pick up a bottle and keep it in your cupboard. Just trust me on this. 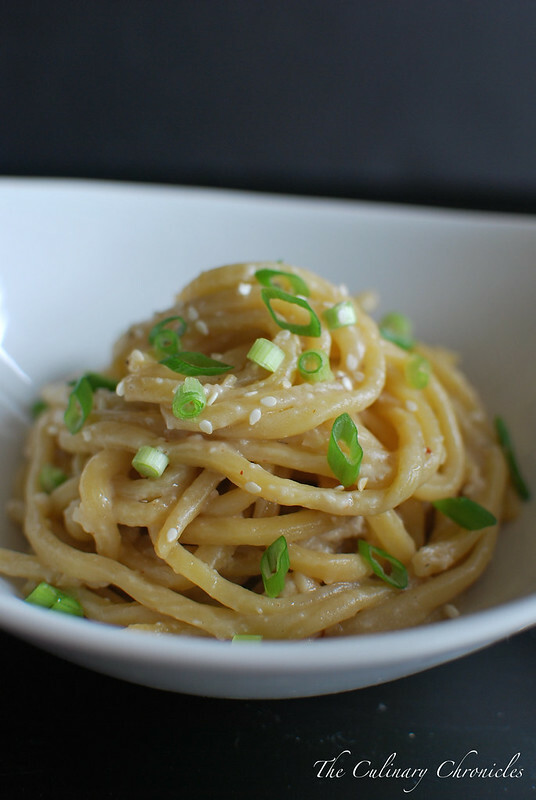 I whipped up these noodles the other week to accompany a quick Asian-style shrimp scampi. The meal was pretty much a BUTTER FEST so obviously it was a hit. But if you want to go vegetarian, sear up some tofu and throw them on a mound of these noodles. You’ll love them just the same. Cook the chow mein noodles according to the direction on the package. Drain the noodles, reserving a few tablespoons of the starchy water. In a wok or large sauté pan, melt the butter and olive oil over medium heat. Add the garlic and sauté until aromatic but not browned, approximately 1-2 minutes. Add the red pepper flakes, sugar and Maggi. Stir until the sugar is dissolved. Remove the wok from the heat and quickly toss the noodles into the mixture. Sprinkle in the black pepper and cheese. Toss the noodles ensuring that it is thoroughly covered. You may add a tablespoon of the pasta water as needed to loosen the pasta. Transfer to a serving dish and garnish with the scallions and sesame seeds. Serve immediately. I love pasta…yeah, yeah, yeah! 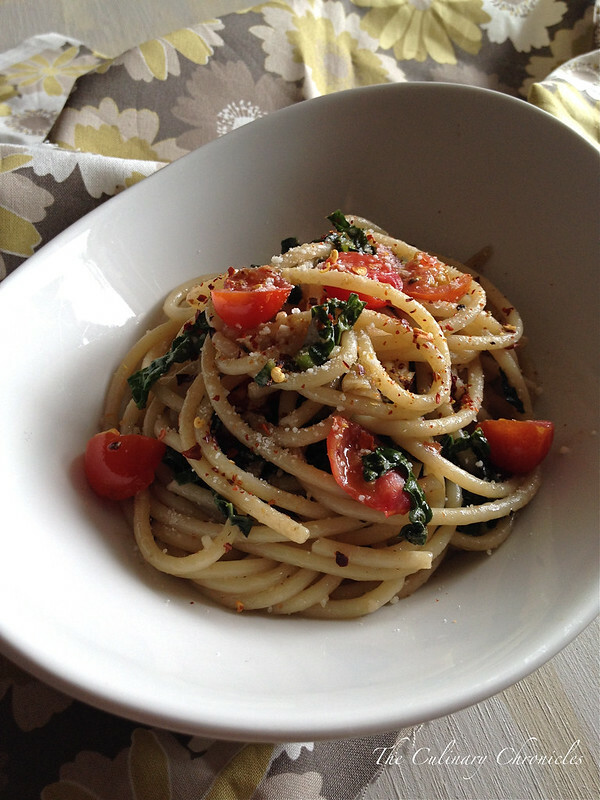 Pasta is so great….yeah, yeah, yeah! That’s my new pasta song. Do you like it? Well obvi you can’t appreciate the full artistry of the song by just reading it. It’s going to be a Grammy hit one of these days. Using two of my most favorite items– spicy Italian sausage and ‘shrooms, this number comes together so quick and is so delish that it’ll be a regular staple in your weeknight dinner rotation. You can also throw in other cast members that you may have lingering in your fridge like bell peppers, carrots, zucchinis, etc. This time around, I ended using whole wheat pasta but feel free to use whichever that tickles your fancy. Boil the pasta for approximately 8-10 minutes in heavily salted water until al dente. Drain the pasta and reserve ¼ cup of the starchy water that the pasta was cooked in. While the pasta boils, heat a large skillet with the olive oil over medium-high heat. Add in the sausage and use a wooden spoon to crumble up the meat while it’s browning. 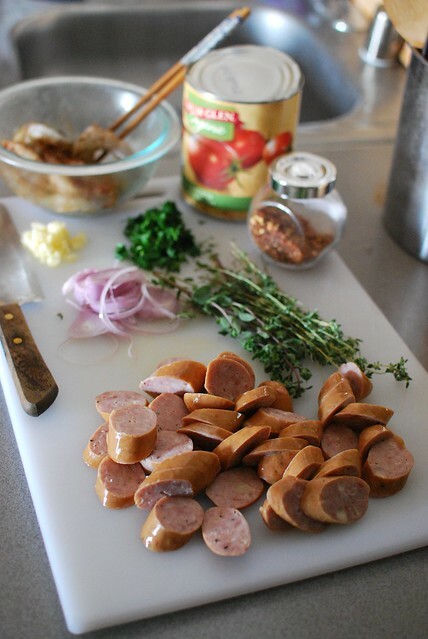 Cook until the sausage is no longer pink (about 1-2 minutes) and add the shallots, garlic, pepper flakes, fennel, oregano, and mushrooms. Sauté the items together for another 1-2 minutes. Add tomatoes with its juices and bring to a boil. Add the sugar, thyme and lower the heat to medium-low. Use the wooden spoon to crush and break apart any large pieces of tomatoes. Allow the items to simmer for 8-10 minutes. Remove the thyme sprigs. 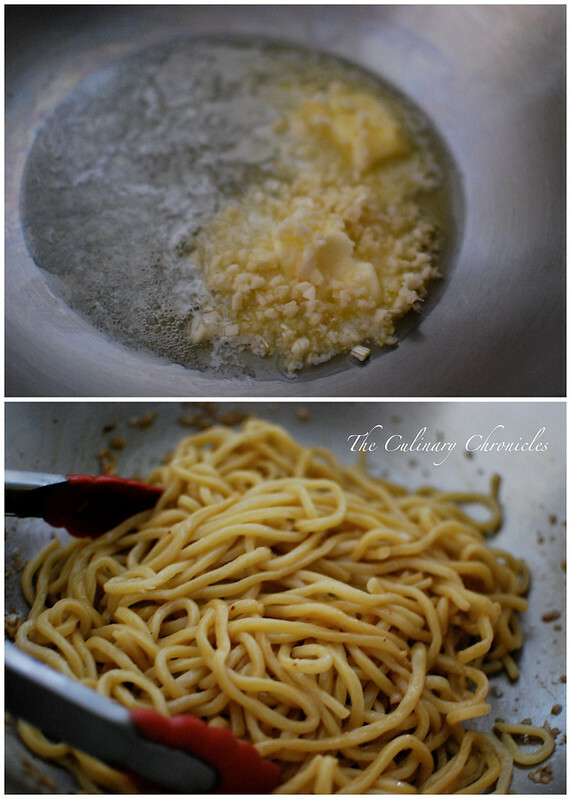 Toss in the cooked/drained linguine, coating the pasta well. If you want a looser based sauce, add a tablespoon at a time of the starchy pasta water until you reach your desired consistency. Season with additional kosher salt and black pepper as needed. Plate the pasta and cover each dish with freshly shaved parmesan. Guys… I moved to Việt Nam. Okay, not really. But I swear, San Diego these past few weeks have been as hot and humid as South East Asia in the dead of Summer! And turning on the oven or kitchen burners has been the last thing I’ve wanted to do. But a girl has got to eat and the lighter and easier the dish–the better! 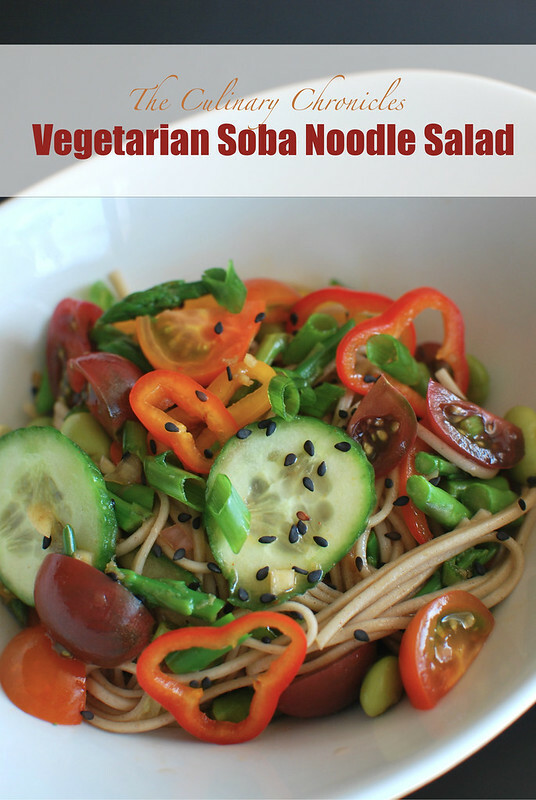 Quick and light bites like this Vegetarian Soba Noodle Salad is the perfect remedy to combat the heat. 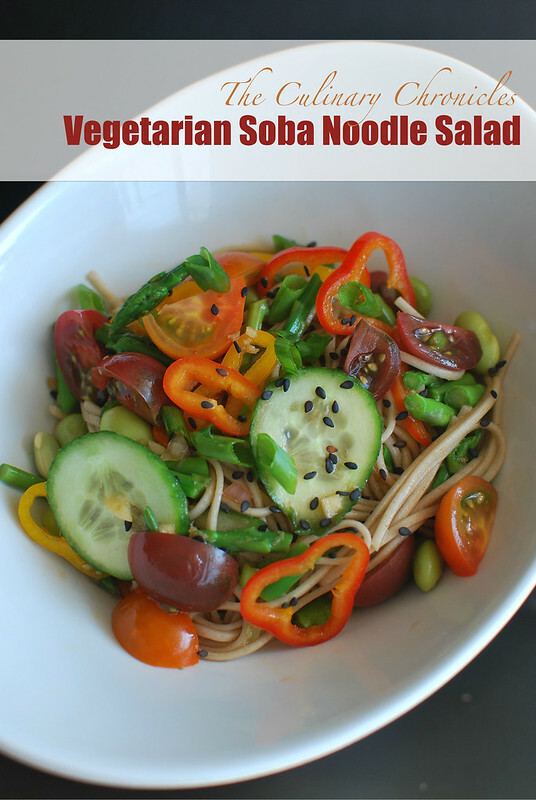 Soba (buckwheat) noodles tossed with fresh veggies in a bright and acidic ponzu sauce is easy to make and doesn’t leave you feeling like gazillion pounds. I opted for a vegetarian take but if you miss the meat, throw in such grilled chicken or shrimp and you’ll be a happy camper. Now excuse me as I pass out in front of the air conditioner. Prepare the vinaigrette by whisking all the ingredients in a small bowl. Season with additional kosher salt and black pepper as needed. Bring a large pot of water to a boil and cook soba noodles for 3-4 minutes or accordingly to package instructions. Drain the soba in a colander and rinse well with cool water. Shake off excess water and transfer to a bowl. Add all the vegetables to the noodles, except the scallions. Add several spoons of the vinaigrette over the noodles and vegetables and toss well. Add additional vinaigrette as needed for everything to be lightly coated. Divide the contents between two serving dishes. 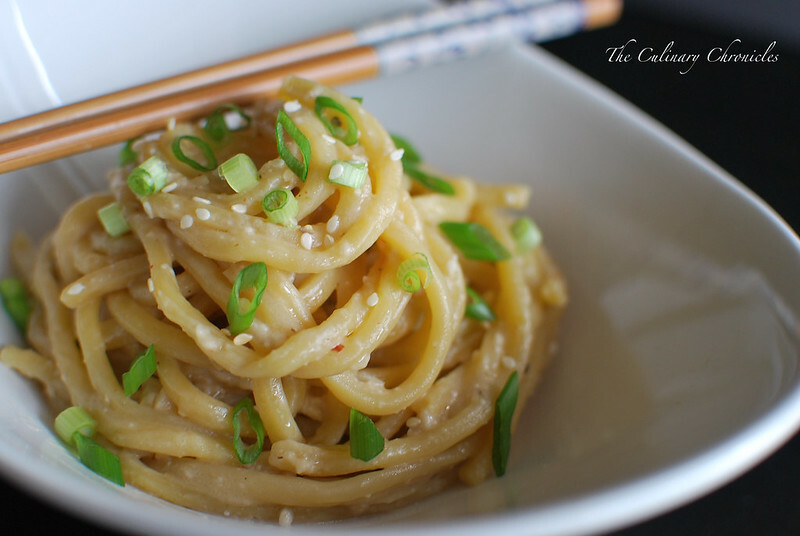 Top each plate with scallions, sesame seeds and enjoy! 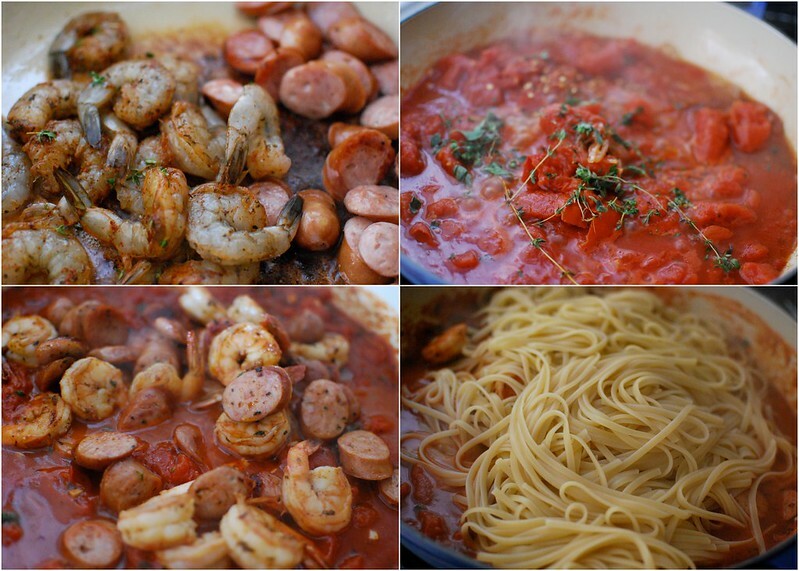 Spicy Shrimp and Sausage Pasta — Surf & Turf Made Easy! Now let me admit this to you. Some girls love flowers delivered to their door and some gals love chocolate. 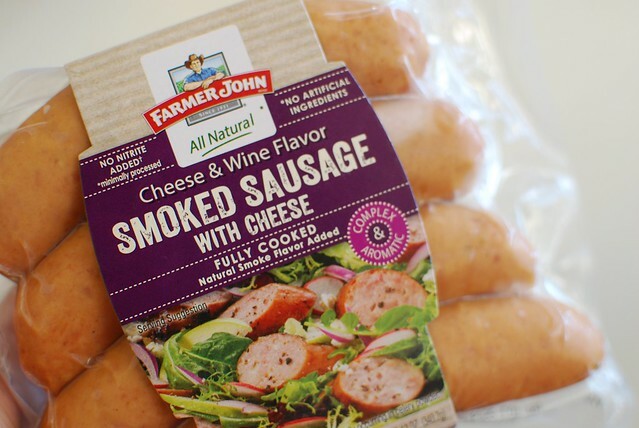 So when our friends at Farmer John sent over a box of their latest Cheese & Wine Flavor Smoked Sausage, I squealed with joy. Not only because I was so excited to try it out but we coincidentally were having our monthly Sunday Family Dinner just a few days after. Complete divine intervention since a part of our menu required for us to bust out our beloved habachi grills. It was perfect since our proteins mainly consisted of seafood (calamari, prawns, shellfish, lobster) and sausage was a much welcomed addition. 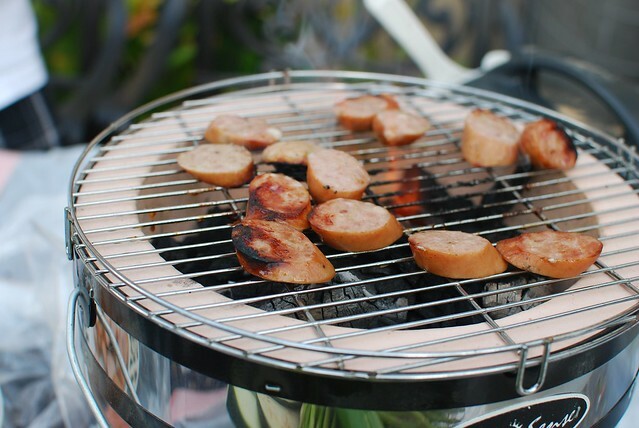 We sliced a few links up and threw them on the habachi which imparted even more of a smoky flavor. The sausage itself turned out to be a tad on the sweeter side (likely because of the wine) but it paired well with the salty-briny seafood. So when it came time for me to use the sausage in a dish, I wanted to make sure to balance out the flavors. Cue in spices, herbs and tomatoes. 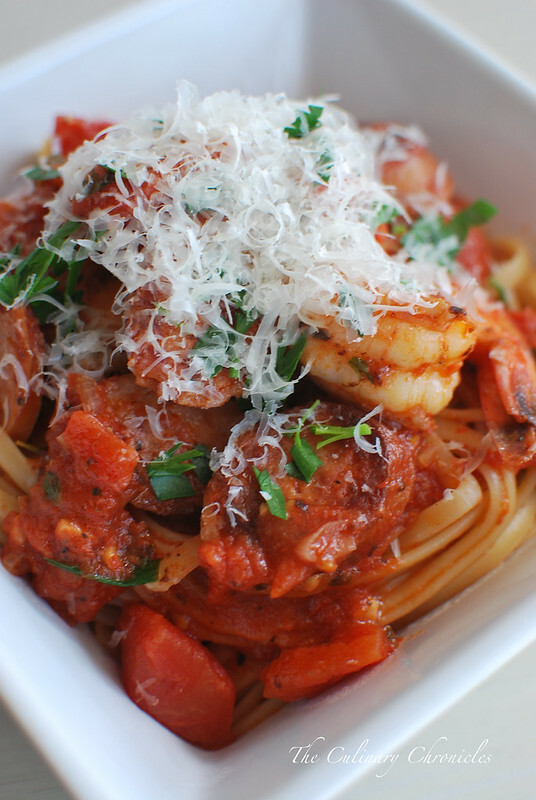 I played around with a few ideas and decided to use the browned sausage with a heavily spiced shrimp in a tomato sauce. I finished the whole sha-bang with a mountain of fresh herbs and tossed it with linguine — a pasta that can hold up to a hearty sauce. The entire dish was then showered with a mound of freshly shaven parmesan cheese….and then I paused….. Followed by a serious dance-it-out session and a swig of chianti…or whatever you’re sipping on. And yes, all of the flavors balanced out perfectly. 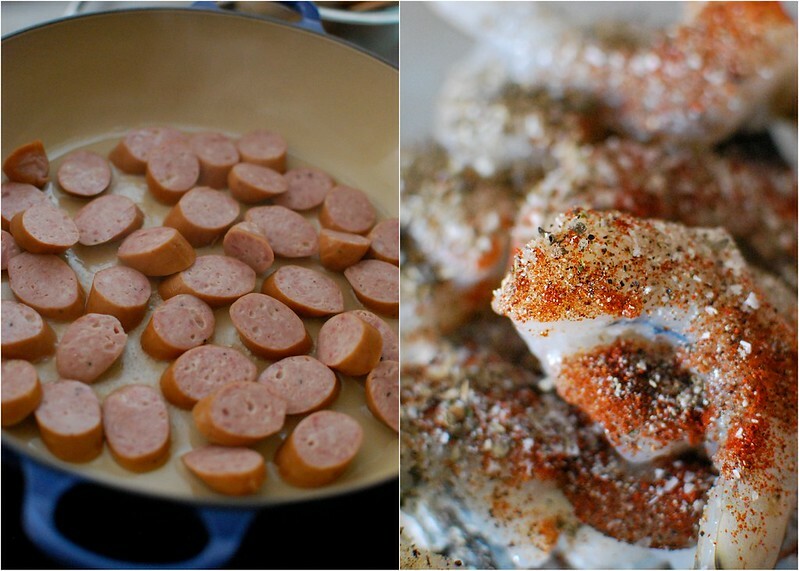 The salty, sweet sausage paired well with the spicy shrimp. 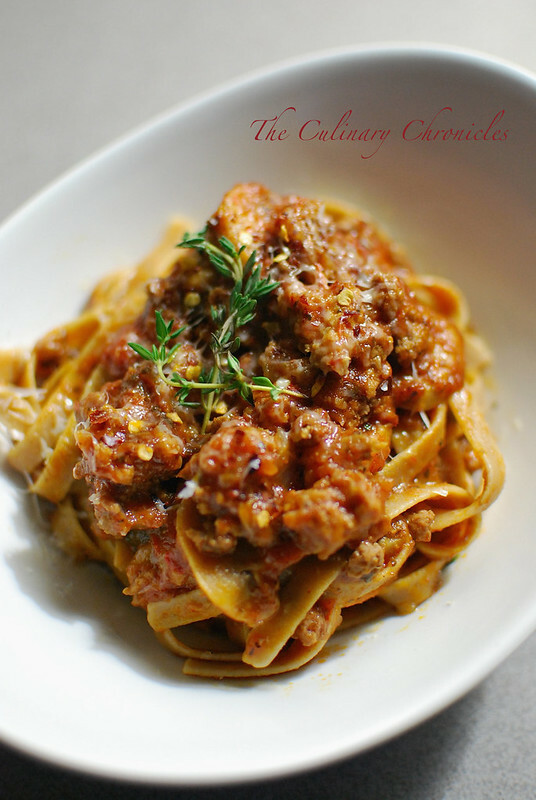 The acidic tomato sauce with its aromatics added the much needed punch to the dish. And the cheese—well, the cheese added love. Much thanks again to our friends at Farmer John – we love ya! In a bowl, mix the shrimp with the Old Bay Seasoning, cayenne pepper, ¼ teaspoon black pepper, garlic salt, ¼ teaspoon kosher salt and 1 tablespoon olive oil. Set aside. Heat 2-3 tablespoons oil in a heavy bottom, deep skillet (or pot) to medium. Add the sausage slices and brown on both sides. Toss in the shrimp and cook until they turn pink – approximately 2 minutes. Remove the contents to a clean bowl and set aside. Add the shallots to the skillet and cook for a minute before adding the garlic. Cook for a minute and stir in red pepper flakes. Add tomato paste and cook for an additional 2-3 minutes. Turn the heat to high and pour the wine into the skillet. Use a wooden spoon and scrape the bottom of the skillet to release all the brown bits. Allow the wine to come to a boil and reduce the liquid for 2-3 minutes on the high heat. Add tomatoes with its juices and bring to a boil. Once it comes to temperature, lower the heat to medium-low. Use the wooden spoon to crush and break apart any large pieces of tomatoes. Stir in the thyme and oregano and simmer the sauce, partially covered for 20 minutes. While the sauce cooks, boil the linguine for approximately 10-12 minutes in heavily salted water until al dente. Drain the pasta and reserve ¼ cup of the starchy water that the pasta was cooked in. 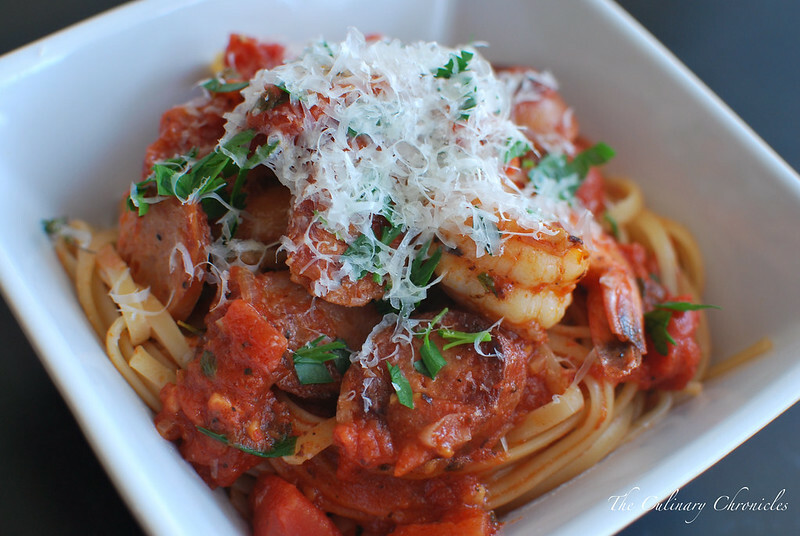 Stir the shrimp and sausage into the simmered tomato sauce. Toss in the cooked linguine, coating the pasta well. If you want a looser based sauce, add a tablespoon at a time of the pasta water until you reach your desired consistency. Season with additional kosher salt and black pepper as needed. Plate the pasta and sprinkle each dish with parsley and the freshly shaved parmesan. When I was in the elevator at work yesterday, I overheard someone saying how they made their grandma’s famous linguine alle vongole for Easter Dinner. I craved pasta all day long. Preferably a pasta that someone’s grandma made but beggers can’t be choosers–I had to settle for something I could wrangle up. So as I drove home I did a quick inventory of what I had in the fridge/freezer and decided upon a quick shrimp scampi. 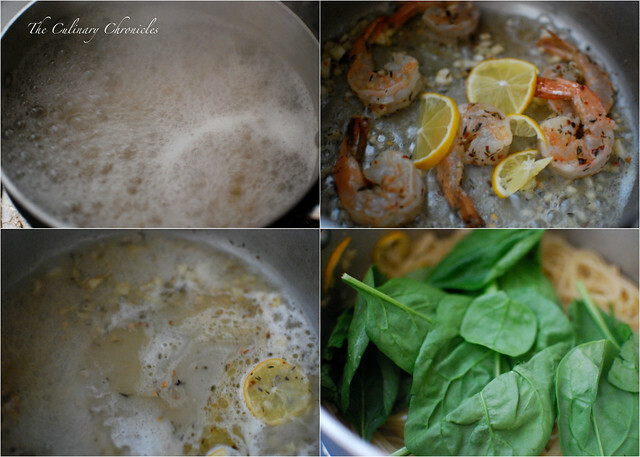 I have a delish recipe for Shrimp Scampi on the blog already but I wanted to change it up a bit. I opted to throw in some fresh spinach leaves at the end for a bit of greens. I had originally played around with the idea of adding peas but went for the spee-natch instead. But who knows, I may throw some peas in next time for some oohs and ahhs. The pasta was bright, citrus-y, uber garlicky (vampires beware) and totally satisfying. And the best thing? 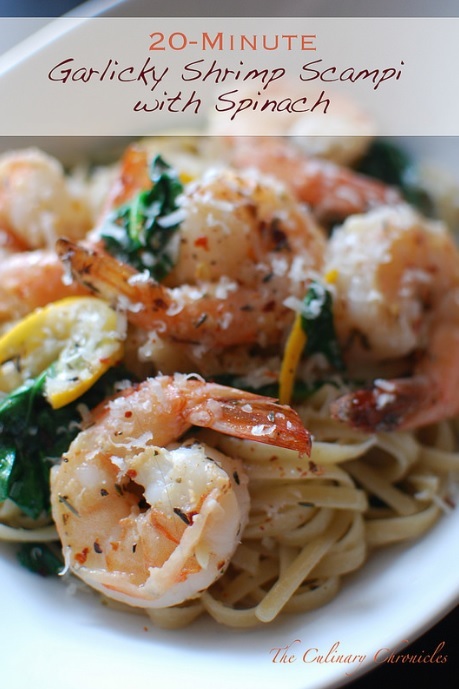 Despite me calling this a 20-Minute Garlicky Shrimp Scampi with Spinach, you can probably have it done in 15. But why not pour yourself a glass of wine during the process and take the few extra minutes? While the pasta boils, mix the shrimp, garlic, red pepper flakes, thyme, and garlic salt together in a bowl. In a large skillet, heat the oil to medium heat. 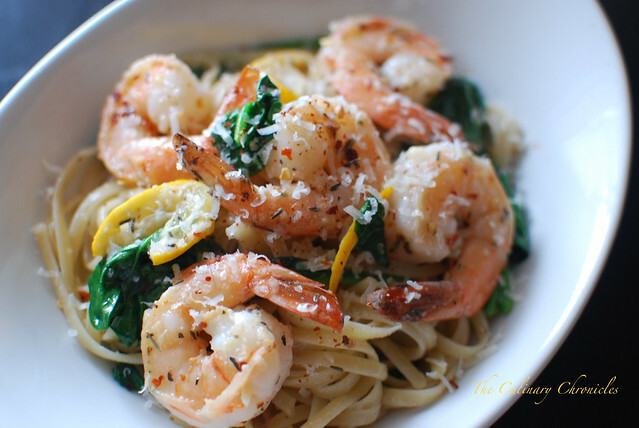 Add the shrimp (with all the garlic and herbs) and lemon slices* to the skillet. Cook the shrimp on both sides until they turn pink—approximately a minute on each side. Remove the shrimp to a clean bowl/plate. Turn the heat to high and pour the the wine into the skillet. Use a wooden spoon and scrape the bottom of the skillet to release all the brown bits. Allow the wine to come to a boil and add the lemon juice. Reduce the liquid for 2-3 minutes on the high heat. Add the butter and whisk/melt it into the reduced wine. Turn the heat to medium-low and toss in the cooked/drained pasta. Vigorously toss the pasta with the sauce, adding a tablespoon at a time of the pasta water until you reach your desired consistency. Season the pasta with additional kosher salt and black pepper as needed. Toss in the spinach and plate the pasta with the light sauce. Top each dish with the cooked shrimp. Sprinkle the top with additional red pepper flakes and parmesan cheese. Serve immediately. *While plating the pasta, you can remove the cooked lemon slices. Some do not enjoy the slight bitter taste of biting into cooked lemons but I’m all about it.